"The US government has released 2,800 previously classified files on the assassination of President John F Kennedy in 1963." + Video: What will top-secret JFK files tell us about Kennedy's killer? "The FBI knew of the threat to kill Lee Harvey Oswald and Soviet officials feared a missile strike after Kennedy’s assassination." "ublication of nearly 3,000 documents sheds more light on response to assassination of US president – but so far no smoking gun." "More than 2,800 files related to the killing of President John F. Kennedy were release Thursday. However, reports say the FBI and the CIA requested that more than 200 others be withheld. President Donald Trump has given agencies 180 days to say why the remaining documents should not be released." "President Trump has decided to release a final batch of thousands of classified government documents related to the 1963 assassination of President John F. Kennedy, Mr. Trump announced in a tweet on Saturday morning." 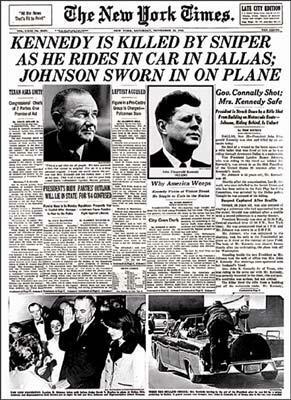 along with businessmen in the South, planned the Nov. 22, 1963, assassination of her husband in Dallas, Texas." "Fifty years ago, President John F Kennedy was shot dead and the events of 22 November 1963 were etched into America's consciousness. From the bright Texas morning to the manhunt for the assassin and into the dark Washington DC night, follow the stories that wove together that day." "A series of 3 Flash animations on the Dallas story, the Warren Commission and the Conspiracy theory." JFK's Assassination, Adolf Hitler, Big Foot, Marilyn Monroe, Abe Lincoln, Roswell New Mexico, Princess Di, Jimmy Hoffa, Waco Texas, Area 51, Bermuda Triangle, TWA 800, and the Lochness Monster.